Total Probability of an experiment means the likelihood of its occurrence. This likelihood is contributed towards by the various smaller events that the event may be composed of. The total probability gives us an idea of the likelihood that an event is supposed to occur or not. There is a trick to it though. The total probability of any can never be negative. Moreover, it can never be greater than 1! Let us see why it is so and what we can do with this information in our hand. Suppose an event can happen in m different ways; where m is a non-zero positive counting number. All of these m ways will have some value for the probability. Let us take an event R, such that P (R) = (Number of ways in which the event gives an outcome of R) / (Total number of ways in which the event can happen). As you may see from the definition of this probability itself, P(R) can never be greater than 1. If P(R) is greater than 1, that means the event can give an outcome R in more ways than it can happen or occur which is absurd and logically incorrect. Hence the value of P(R) or for any event will be less than 1. P (Total) = (a + b + c + ….)/N. The term in the numerator defines the total number of ways in which this event can happen so it is equal to N. hence we can write that P (Total) = N/N = 1. Now let us say that an event has two possible outcomes only. If the probability of one of these events is 66% then what is the probability of the other event? Answer: This may seem impossible to answer if you don’t take into account the fact that the total probability of an event is 1. Since the given event can happen in only two ways, out of which one has a probability of 66% or .66. The other has to contribute in a way that the total probability of the event becomes = 1. thus we see that the probability of the other event should be = 0.44 or 44% such that the probabilities sum up = 1. A) The probability of the third event is greater than the second event. B) P (the third event) is greater than the first event. C) The probability of the third event is 1/6. D) Both the options A) and C) are exactly correct. 1/2 + 1/3 + P(C) = 1 or P(C) = 1/6. Hence the option C) is correct or the probability of the third event is 1/6. Example 2: An event can occur in two ways only. If the difference of the probabilities of the two events is 20 %, what are the individual probabilities of the events? A) 60 % and 80% B) 70% and 50% C) 90% and 70% D) It could be anything! Answer: Let us see if the principal of the sum of all probabilities can help us here. The sum of the two probabilities is 1 or 100%. Their difference is 0.2 or 20%. Let us say that A represents the probability of the first event and B the probability of the second event, then A + B = 1. As the event can happen in two ways only. Also, A – B = 0.2 so that we have two equations. Adding the two equations together, we get 2 A = 1.2 or A = 0.6. Thus A = 60% and B should be 80 % then. Hence the option A) 60% and 80% is correct. Note that in a simple event we can use the same reasoning and prove that the total probability of a simple event is = 1. Learn the Probability of Random Event here. Q 1: An event can happen in three different ways. The difference of the probability of the first two is .4. 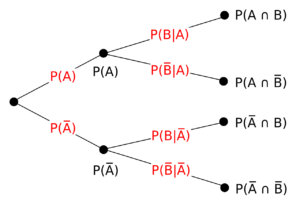 While the sum of the probabilities of the second and the third terms = 0.4. What are the probabilities of each event in order?